Steadman’s Ace Hardware in Miles City, Montana has a complete selection of canning supplies year-around. Canning vegetables and fruit from our south eastern Montana gardens is a great way to preserve the fall bounty well into winter – and beyond. download a canning checklistCanning isn’t really difficult, especially when you have all the right equipment ready to go. With the Purchase of Any Canning Tools or Supplies. Pick yours up at checkout! 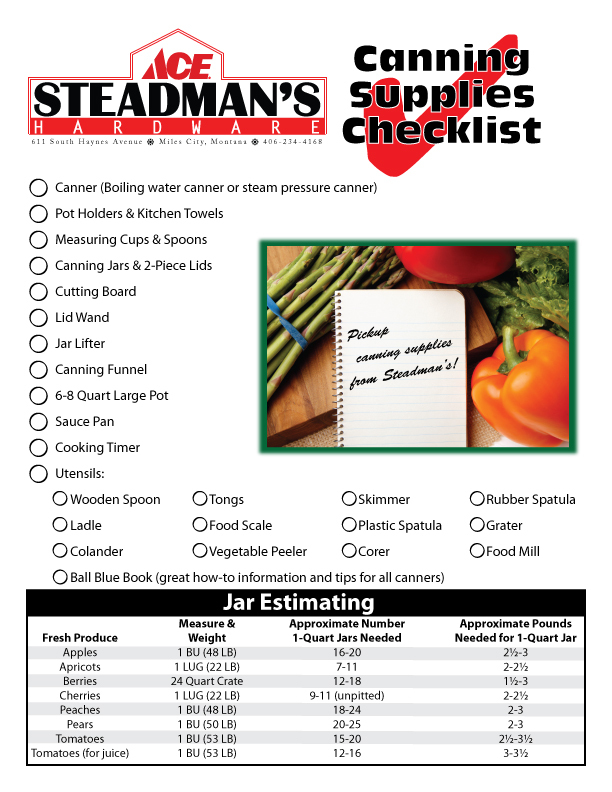 Download and print our Canning Checklist before you start canning this year. Grow your own fruits and vegetables or buy them locally at the Farmer’s Market; you’ll be able to lower your grocery bills, live off the land and eat good nutritious food at the same time. 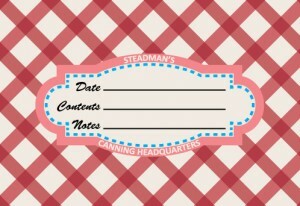 Come into Steadman’s and let us help you get started with your canning project. Wide Mouth & Regular Canning Jars and Lids by Ball®. Metric sized canning jars and lids from Leifheit®. Vinegar, Pectin, Fruit Fresh, Citric Acid, Pickle Crisp, Lime and Pickling Salt, Mrs Wages® Chili Base mix, Pasta Sauce mix, Salsa Mix and Hot Salsa Mix. Ball® brand mixes include Kosher Dill pickle mix and Bread & Butter pickle mix. Sauce Master by Norpro®, Pressure Canners, Steam Canners, canning accessories, jelly and jam strainers, canning funnels, jar lifters and canning racks. Saves time and water when preparing a meal.